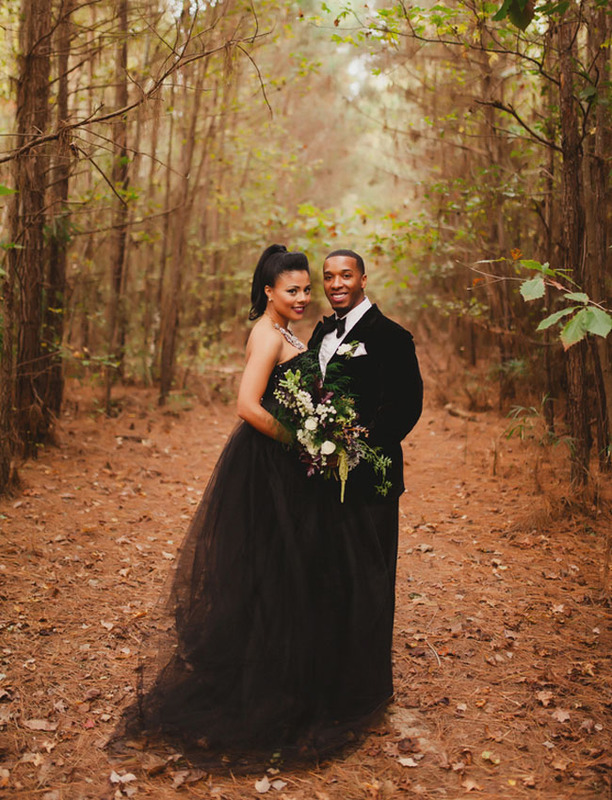 What started out as a fun, unique winter styled shoot quickly became a real-life magical elopement for Candice + Bradley, sweethearts since high school who have been engaged for three years. 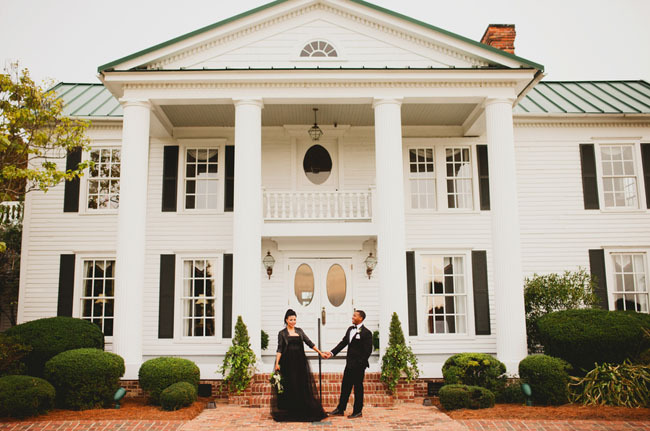 Since they hadn’t yet pinned down a date to make it official, they jumped at the chance to exchange their vows in the stunning setting Unveiled Design Events + Teacup Floral dreamt up and created. 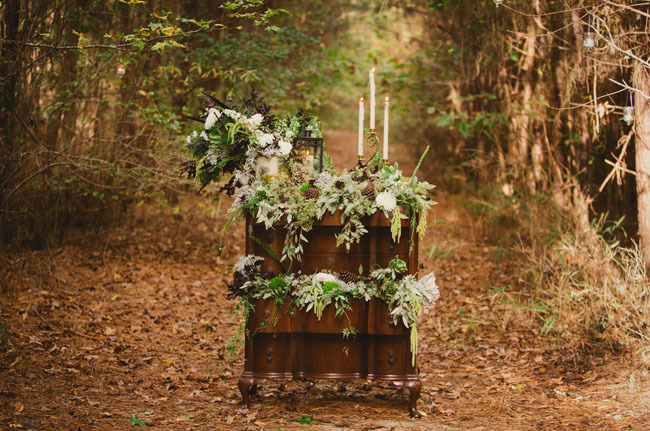 The photographer behind these lovely images, Christina from J. Christina Photography, describes the scene so beautifully: Black, white, greens, and golds turned this secret wooded pathway into a stunning altar backdrop. 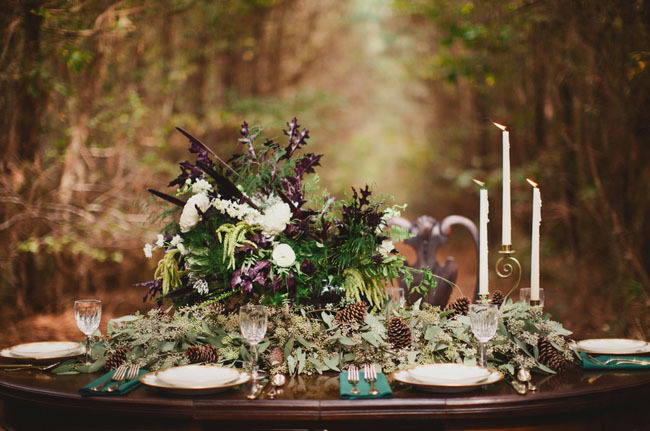 Our inspiration for this editorial shoot was a sweet Southern plantation, tall pine trees, and cozy black velvet. 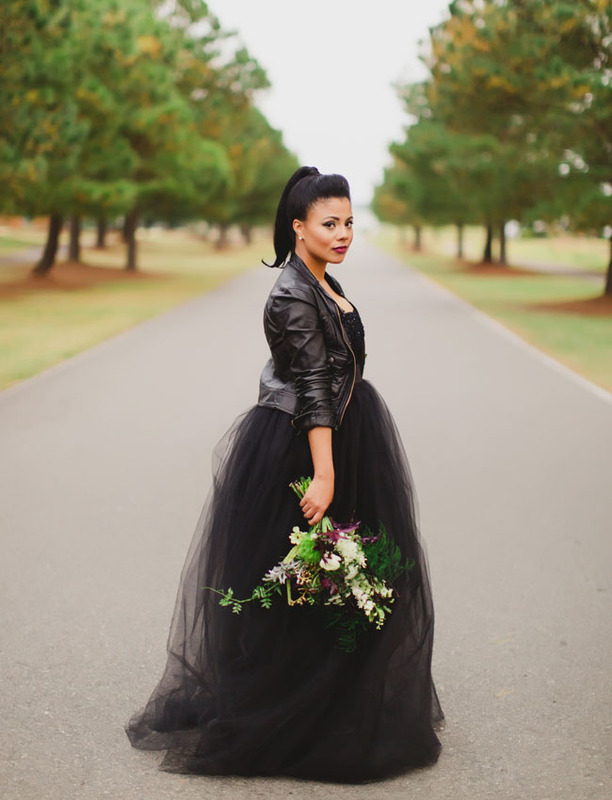 The energy shifted from a fun styled shoot to excited anticipation to be apart of a real love story unfolding before us. It was sweet, tender and perfectly intimate …. 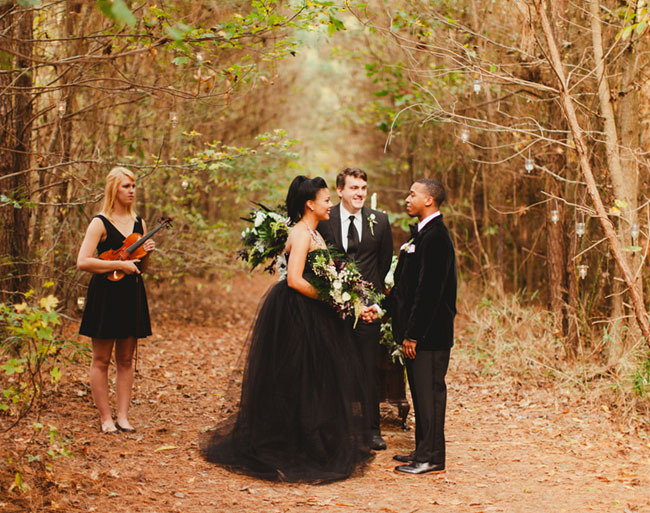 as ideal as an elopement ought to be. 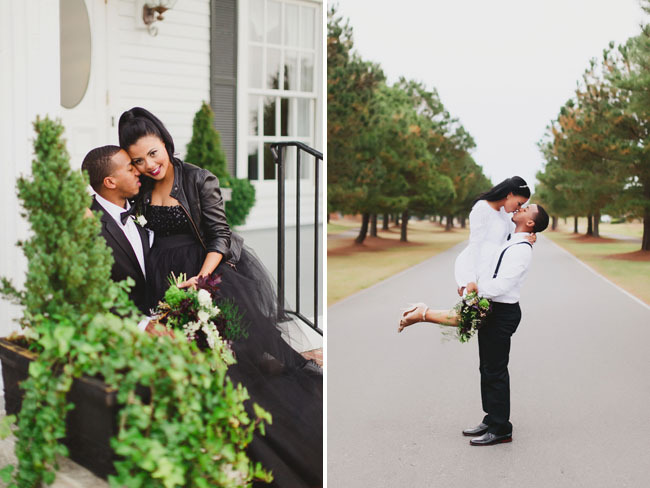 We’re so glad that Candice + Bradley got to take advantage of the team’s hard work! 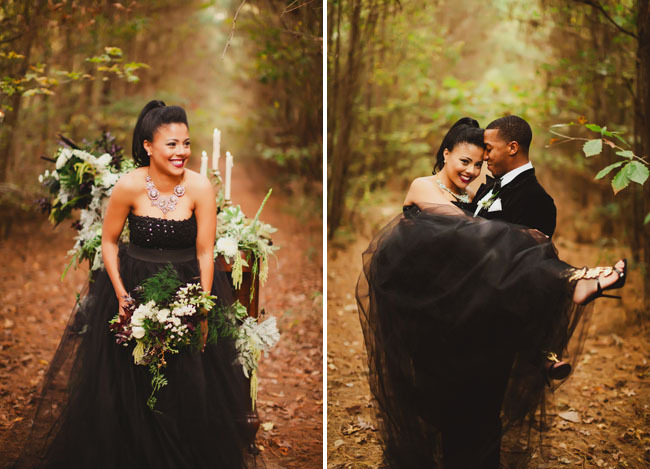 How much do you love Candice’s stunning black dress?! It’s actually a skirt and top! Love it. The skirt is from Bella Lucia Boutique and the top is from The Limited. The outfit is a perfect fit for C’s avänt ɡärd style. Talk about a statement shoe! Lovin’ those Giuseppe Zanottis! 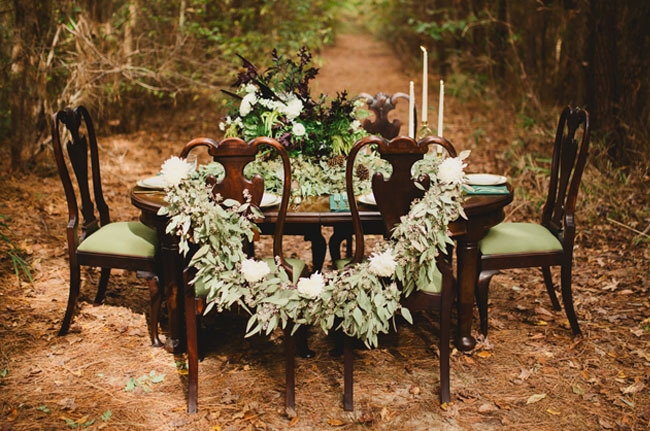 Teacup Floral really brought to life the inspiration for a modern-woodland affair. 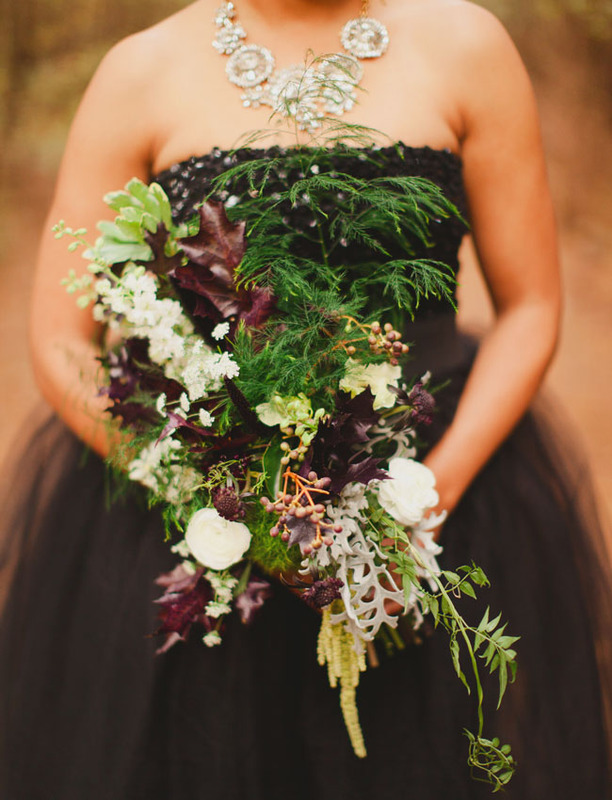 The rich textures + darker hued ingredients made for such an elegantly dramatic look. 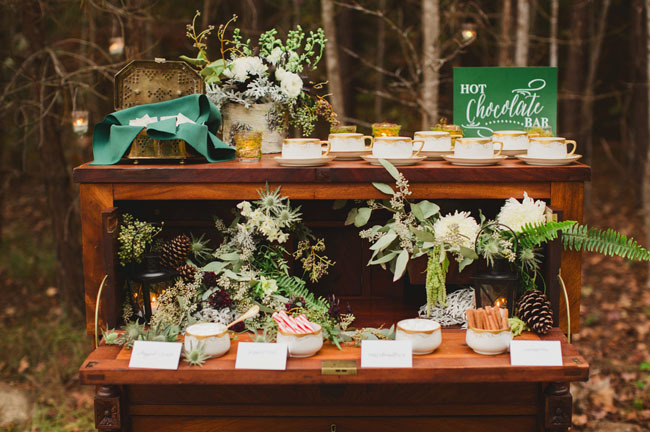 Julianne says, A hot drink station brought in some fun winter elements while Amanda Day Rose designed beautiful green and white stationery to complete this unique fete. 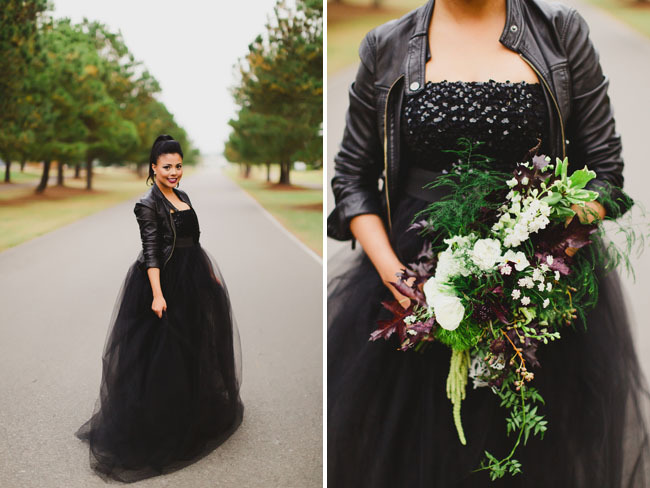 Gotta love a gal who can rock a motorcycle jacket on her big day! 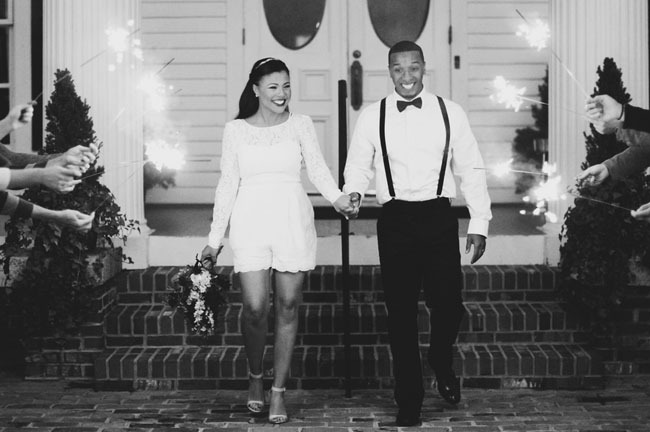 We love that these two finally made it official…and with so much style, too! 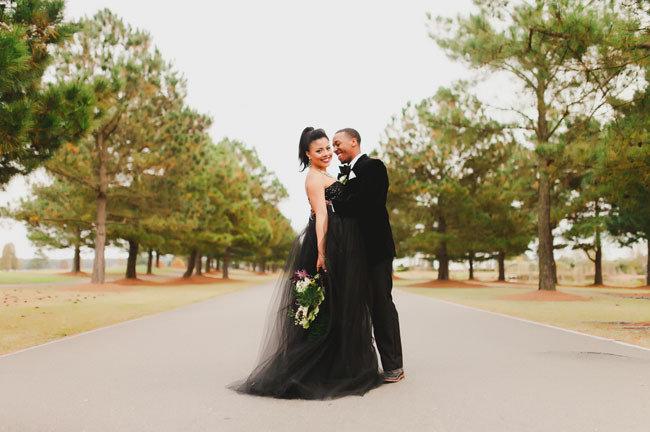 Congrats to the happy couple + thanks to the talented team below for sharing! So beautiful! 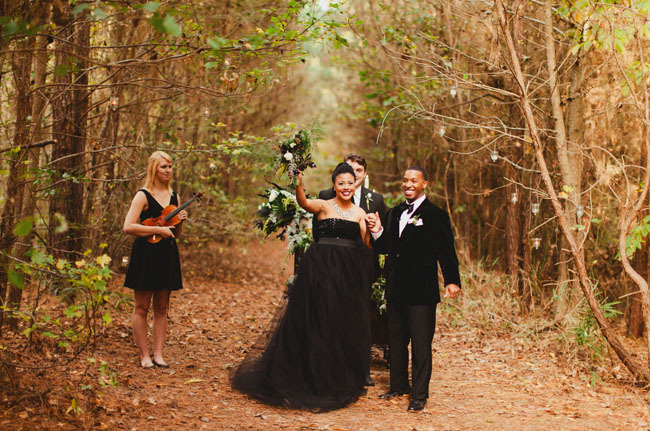 What an amazing elopement! That dress is everything. THIS IS EVERYTHING!!! AHHH!! Her dress (love that it’s a skirt and shirt! ), shoes, leather jacket, the outfit she changed into!! 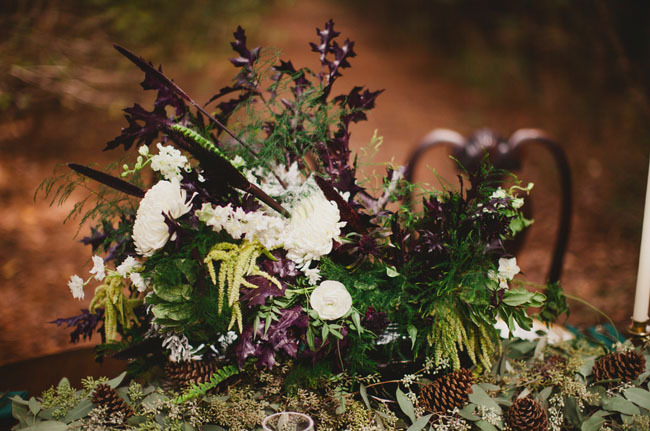 Oh and all of the magical woodland theme details. Plus they are just so adorable together, what a lovely couple. Thank you for sharing this! 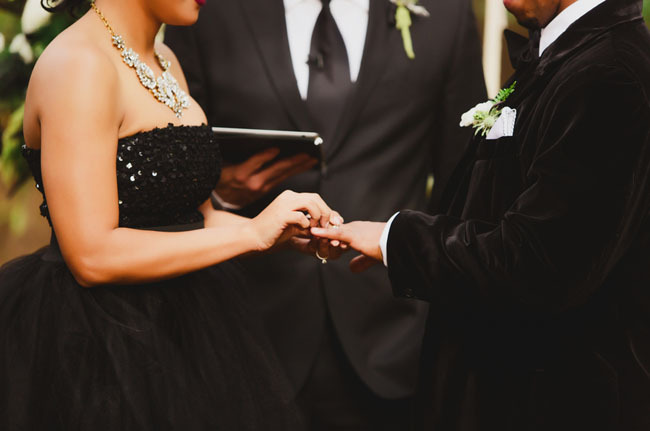 Makes me want to be a wedding blogger again!! 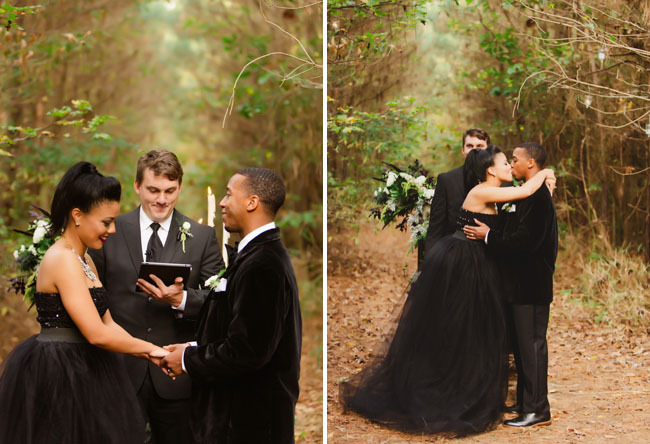 I love the bride’s dress! 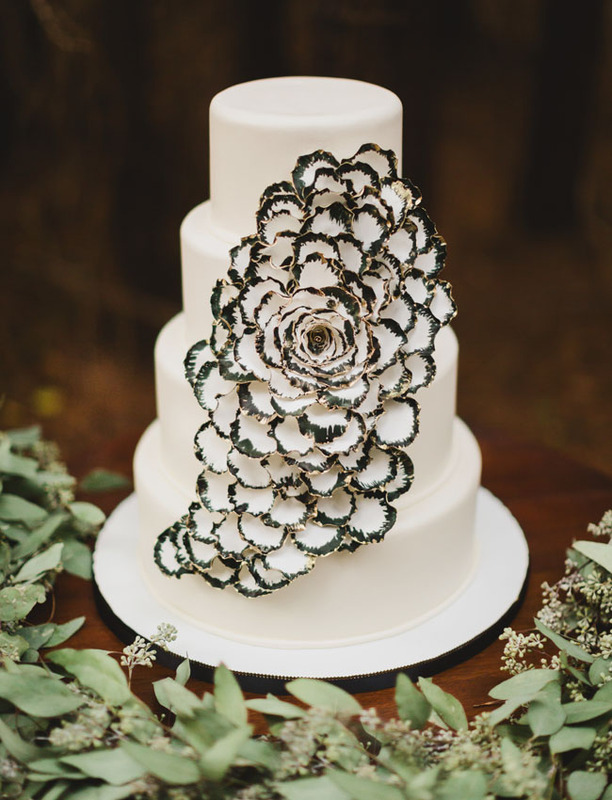 Everything looks amazing and the cake takes the cake. 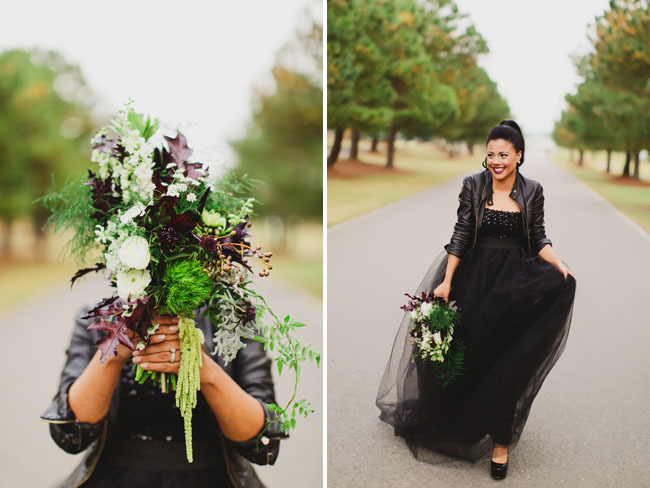 So lovely to see a styled shoot with two people who are so obviously in love. 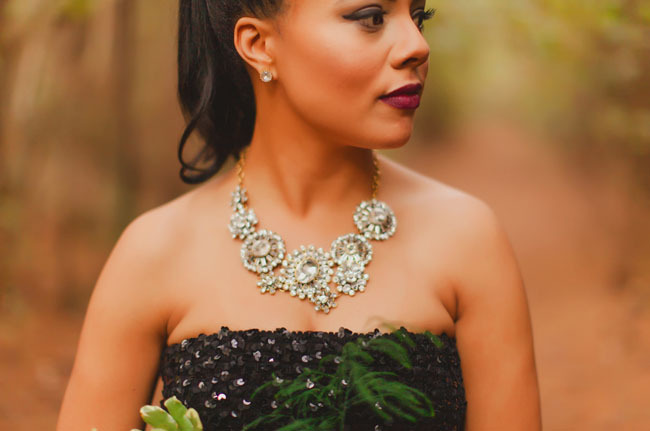 And what a stunning bride! Oh Wow! 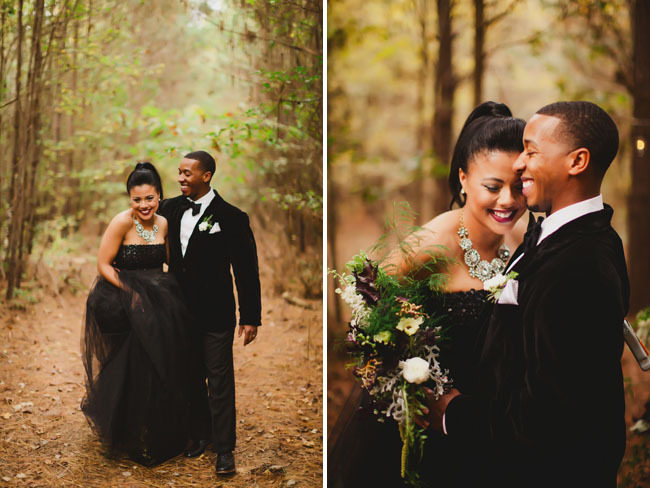 Gorgeous couple and gorgeous photography! The details and setting are some of the most beautiful I have seen. Love the hot chocolate bar! 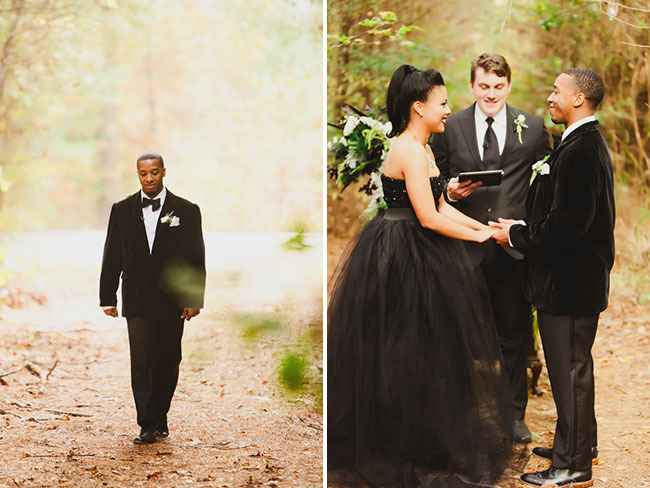 This is a beautiful little story, they must be so in love! Adorable! The shoes she’s wearing are incredible!!! Love this! Such style and so pretty!